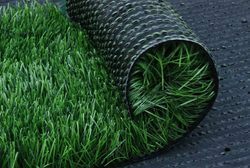 Manufacturer of Artificial Turf. Our product range also comprises of Indoor Sports Floor, Outdoor Sports Floor and Portable Sports Floors. We are one of the well-known players in the market highly recognized due to our use of industry graded components and advanced technology one of which is our Artificial Turf that finds its application in multiple sports. Furthermore, a lot of schools, colleges are also making an extensive use of our turfs that is highly recommended for rough and tough use.